Flashback Database is faster than traditional point-in-time recovery. Traditional recovery uses redo log files and backups. Flashback Database is implemented using a new type of log file called Flashback Database logs. The Oracle database server periodically logs before images of data blocks in the Flashback Database logs. The data block images are used to quickly back out changes to the database during Flashback Database. 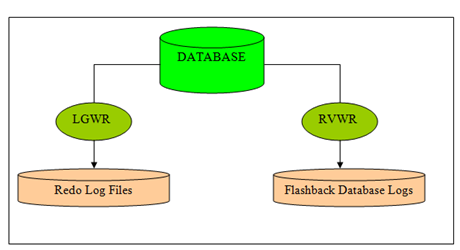 When Flashback Database is enabled, a new RVWR background process is started. This process is similar to the LGWR (log writer) process. The new process writes Flashback Database data to the Flashback Database logs.